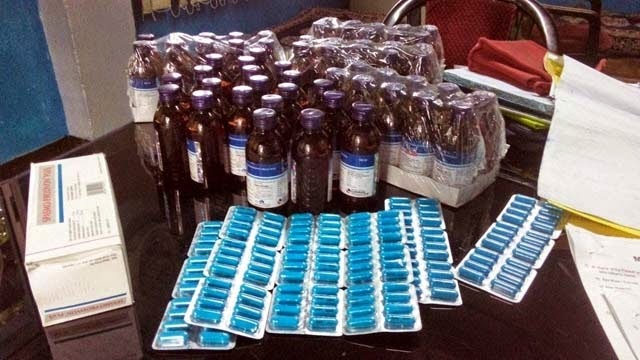 Mukesh Sharma: Two Sikkim youth Chenda Sherpa (24) and Ashok chettri (25) of sangkhola singtam, Sikkim were held with drugs after police caught them with 60 bottles of escuf cough syrup, 144 tablets of Spasmo Proxygen at 10 (N-10) Rambi bazar under Rambi OP today around 3.30 pm. Police who started a Naka checking last this afternoon stopped a Maruti 800 car no SK 01/PA-1329 and when checked the vehicle found the contraband substances and arrested the duo and size the vehicle . Duo has been booked under section 18 (b) and 27 (c) of W.B drugs and cosmetic act and will be produced tomorrow before Kalimpong court. This is the second case when Sikkim youth has been arrested . The first case was recorded on 19th April where three youth were arrested by Rambi police.